She endorsed a fittingly feminine, pro-compassion sci-fi classic while introducing her mother at the DNC. I remember one week talking incessantly about a book that had captured my imagination, A Wrinkle in Time. Only after my parents had listened to me would they then talk about what they were working on, education, healthcare, what was consuming their days and keeping them up at night. It is quite, yes, ordinary that teenage Chelsea might have been smitten with Madeleine L’Engle’s 1963 book, a young-adult fiction touchstone. But it’s possible to read greater significance into the mention of this particular young-adult-fiction touchstone on the night when her mother became the first female major-party presidential candidate. The parallels between Meg Murry and adolescent Chelsea Clinton are obvious from that quote alone, right down to the description of braces and unruly hair. As Lindsay Lowe noted for The Atlantic in 2013, Meg is an introverted, brainy heroine rather than a spunky, hotheaded one, a distinction that likely appeals to both Clinton women. And Meg, like Chelsea, is the daughter of two very high-powered parents—a spacetime-hopping astrophysicist dad and a microbiologist mother who eventually wins a Nobel Prize. There are extra-textual comparisons to be made, too: L’Engle once said that the novel was originally rejected by dozens of publishers, partly for the reason that it “had a female protagonist in a science-fiction book, and that wasn’t done”—a gender barrier of a different sort than the one broken last night. Dig more into the book’s plot and you find other levels on which it’s a fitting thing to have invoked at the DNC. Meg travels through wormholes searching for her missing father, who’s trapped by a force known as IT, an embodiment of evil that can control peoples’ minds. Christian faith figures in throughout her struggle, including when Meg is told to turn to 1 Corinthians 1:27: “But God hath chosen the foolish things of the world to confound the wise; and God hath chosen the weak things of the world to confound the things which are mighty.” How does she eventually defeat IT? By using the only thing she has and IT does not: love. 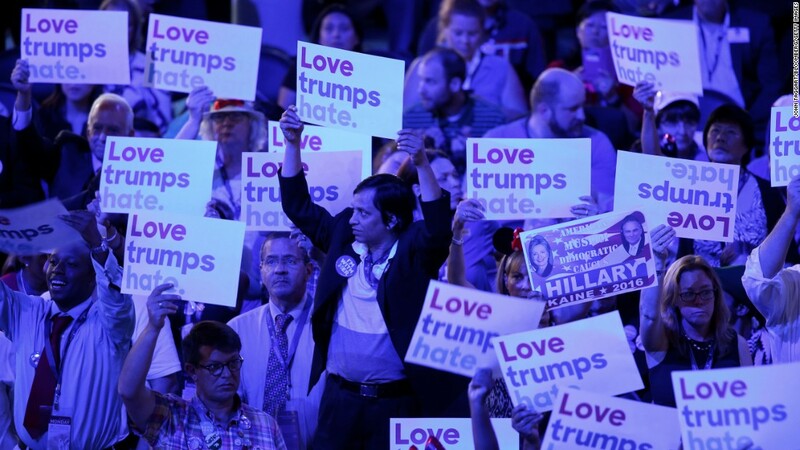 The force, in other words, that this week’s convention has repeatedly announced trumps hate.